This handmade sculpture by Michael Patrick Garman honors the brave soldiers of the United States Military who answer the call to duty. 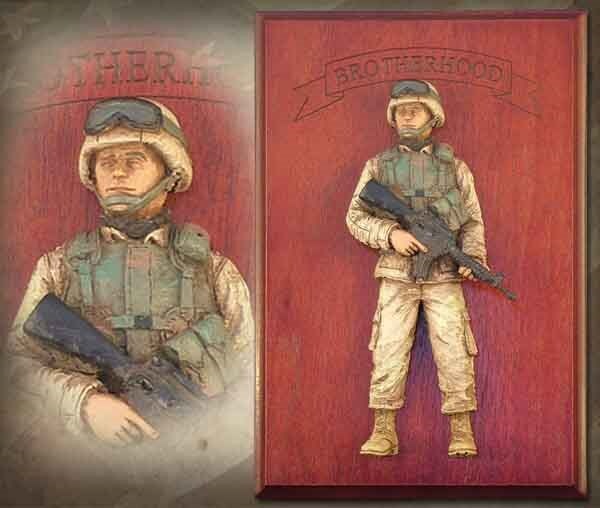 The Brotherhood Edition is a variation of our classic “American Soldier” statue, modified into a wall-hanging unit. Sculpture measures 11″ x 7.25″ x 2.5″. ©2003/2014. Handpainted finish. Includes cherry wood “Brotherhood” base. #MG580.